This is an accessible and delightful trek, heading from Callejon de Huaylas to the Conchucos following a pre-Inca trail primarily, culminating in the famous temple of Chavin. Here we will appreciate the technology and knowledge of astronomy of this ancient culture. On the road you can see the peaks Shaqsha (5703m), Uruasraju (5735m), Huantzan (6395m), as well as the daily lives of the people who live nearby. 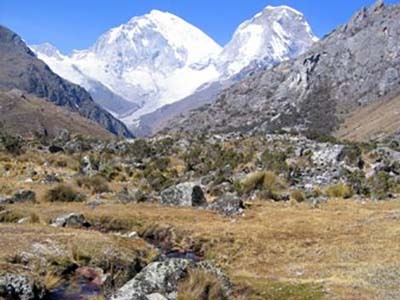 Huaraz- Canrey Chico - Sacracancha (4080m) We will leave from Huaraz to the village of Canrey Chico 3450m. From there wee can see beautiful views of the terraces and snowy peaks of Huascaran National Park until we reach the first camp (Sacracancha, 4080m). We slowly ascend to Yanashallap Pass (4700m), where we will see the snow covered peaks of Umashraju, Huantsan, Rurec, and other mountains. We will pass by the region of Callejonde Huaylas to the alley Conchucos on the east side of the Andes. The path that emerges from the passage is pre-Columbian, with slabs and zigzags along the peak towards camp. This day we begin the trek to Chavin (3150m), passing by some roadside towns and villages. In the afternoon we explore the Chavin archaeological site, which has many galleries and is full of anthropomorphic figures carved on stone faces. From there we return to Huaraz by bus.